RadImageGallery for ASP.NET AJAX enables developers to rapidly display collections of images by writing little to no code. Thecontrol features built-in paging, navigation, and a set of beautiful animations for a nice experience navigating between images. The ASP.NET Image Gallerysupports multiple ways for binding depending on the available data source for the project. ImageArea - containing the original image, controls for navigation ,slideshow and full-screen buttons. 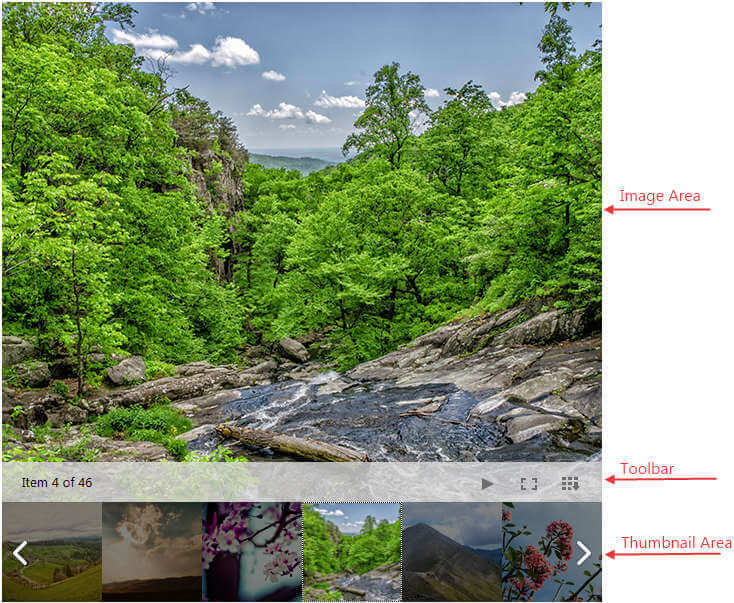 ThumbnailsArea - contains small, scaled version of the images bound to the control.When an image from the area is selected, it will be displayed in its original size inside the ImageArea. The way in which the image will be shown depends on the specified DisplayAreaMode.